You’ve recently graduated and you’ve just landed a job. Alternatively, you may have switched jobs and joined a new company. What does that really mean? What is expected of you? How will you fit in? How will you advance in the business? 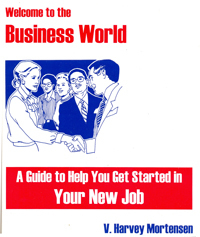 Author, V. Harvey Mortensen, helps you answer these questions so that you can embark on a rewarding career in the business world. He shows you how to become a valuable "asset" for the company you work for. He also demonstrates how to plan and get organized and then to set objectives for yourself. He also emphasizes the importance of advancing your knowledge base through training and further education. He shows you how to take advantage of corporate gifts or recognition. This book will help you get started in your new job and make the correct decisions that will lead to your ultimate success. It can help you develop the power, enthusiasm and drive that can propel you into the executive suite and beyond. Chapter 1: "Ignite Your Start"
Chapter 2: "You As An Asset"
Chapter 3: "You Will Make Vital, Measurable Gain and Accomplish"
Chapter 4: "You Can and Must be Organized"
Chapter 5: "Setting Your Measurable Objectives"
Chapter 6: "Perfect A Skill Which You Will Use Forever"
Chapter 7: "You Can and Will Manage Balance in Your Working Life"
Chapter 8: "You Should Continue Your Training"
Chapter 9: "Accelerate Your Career and Accomplishments through Education"
Chapter 10: "Go After Those Corporate Gifts or Recognition"
Chapter 11: "The Obligation is Now Yours to Prove You Are That Great Asset Anticipated"
Chapter 12 "Get a Great Start and Obtain a Love for Your Work"
Welcome to the Business World: A Guide to Help You Get Started in Your New Job, by: V. Harvey Mortensen; 169 pages, ISBN 978-1-55270-147-8 softcover, published in 2004; Canadian $26.95.